With the use of YITH WooCommerce Catalog Mode, you can show or hide the price and/or “Add to cart” button for products of your shop. If hidden, you can provide a form through which users can send possible requests, like the ‘contact us’ button in the example below. 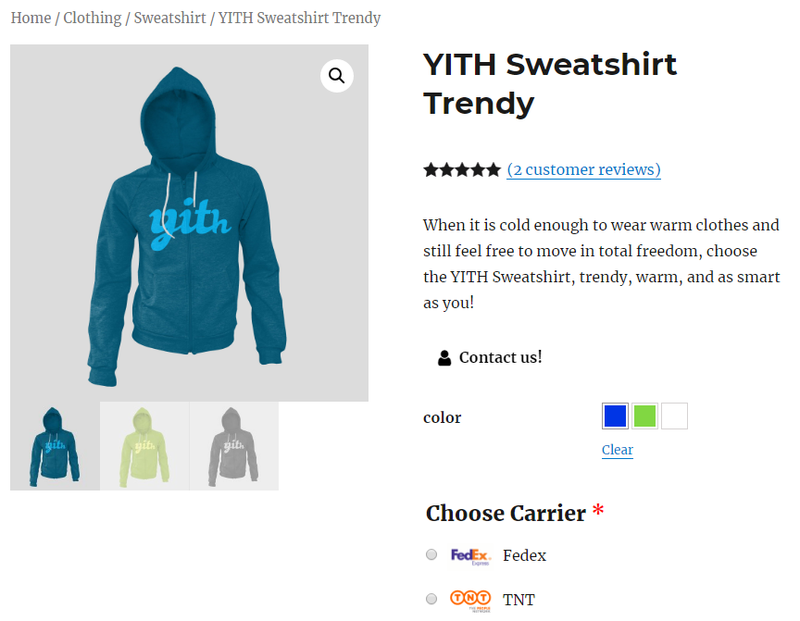 YITH WooCommerce Product Add-Ons is integrated with YITH WooCommerce Color and Label Variations. 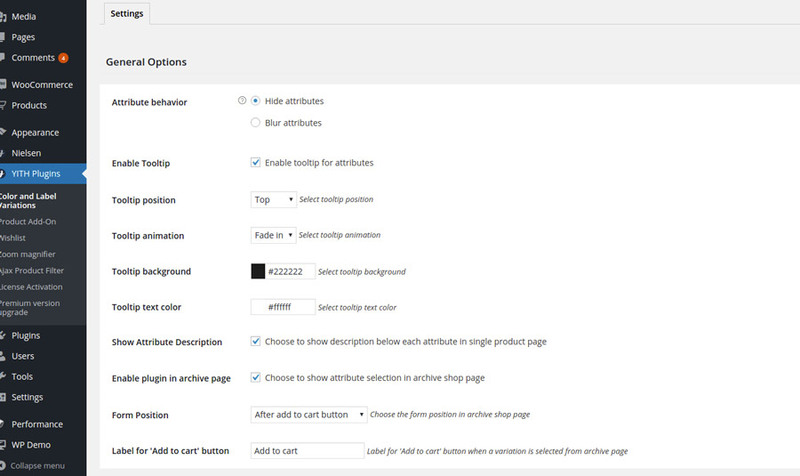 When the two plugins are both active, Color and Label Variations provides the management of attributes and variations previously managed by YITH WooCommerce Product Add-Ons. 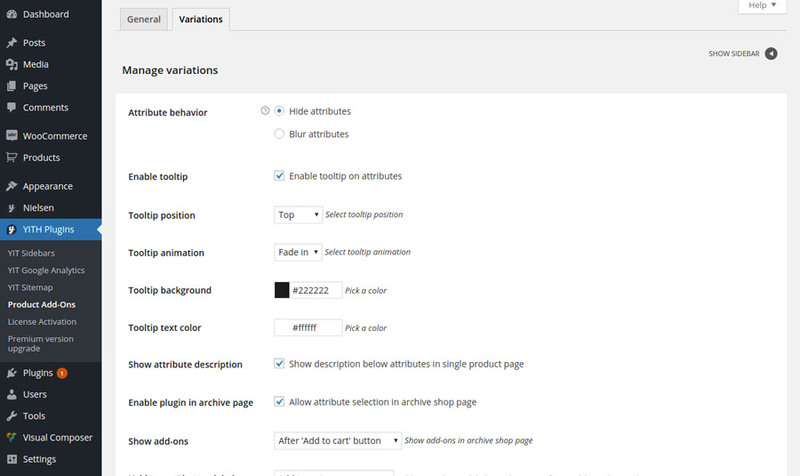 All options included in “variations” section of YITH WooCommerce Product Add-Ons settings dashboard will be available in YIT Plugins -> Color Label Variations. With YITH Composite Products for WooCommerce you can create products which are made of several components, allowing users to be free to choose the components they are interested in straight from the product page. To make the two plugins work together, you’ll only have to activate both plugins. The two plugins combined allows you to create add-ons, which you can add to “Composite” type products. Add-ons are strictly related to the main product, not to the sub-products that compose it (Like ‘Materials’ in the example above). YITH WooCommerce Deposits and Down Payments offers your users the opportunity to leave a deposit for a specific order, and pay the balance at a later time. The deposit can either be a percentage of the product price or a fixed price and vary from product and variation as well, if you want to. The integration with YITH WooCommerce Deposits and Down Payments allows you to enable a deposit service even for products with one or more add-ons. A deposit will be placed on the final price. To start using these combined features, you just have to make sure you’ve installed and activated the premium version of both plugins from the Plugins page. Then, configure the deposit general or product settings and the add-ons on your products. The following is a sample product with more add-ons that add an extra price to the product. Deposits plugin allows paying a 30% down payment for this product that is calculated on the total price after the add-ons are selected and their price added to the base price. 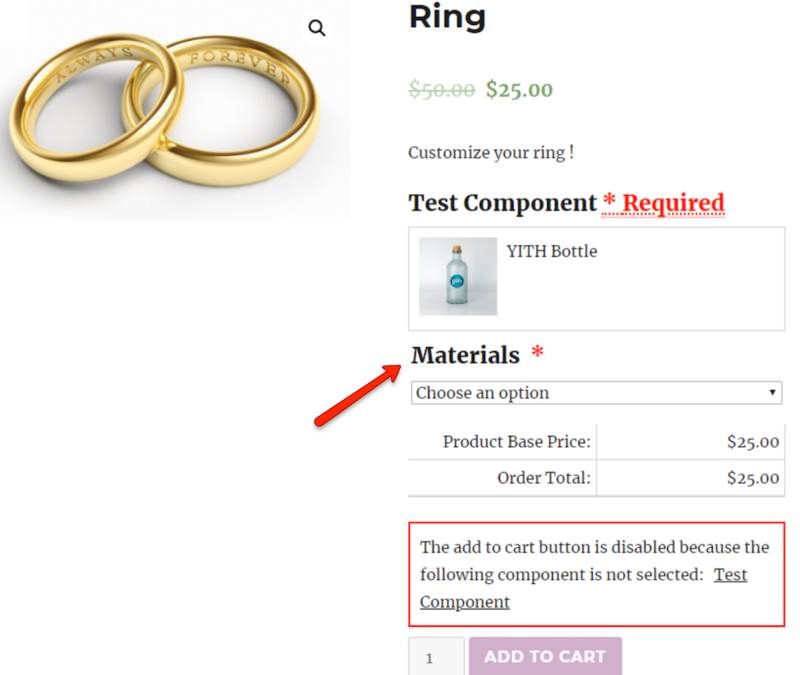 For more details about YITH WooCommerce Product Add-ons, please, refer to the official plugin documentation. The plugin is integrated with YITH WooCommerce Multi Vendor. The integration between the two plugins allows, in a multistore shop, vendors to create advanced options groups for their products. If you have installed and activated the two plugins, go to “Add-ons” section of YITH WooCommerce Multi Vendor settings dashboard and enable YITH WooCommerce Product Add-Ons functionalities for all vendors. At this point, all vendors will have the possibility to create options groups directly in their own administration area. Each vendor can create global, category or single product options groups. All options groups created by vendors won’t be shown on products that don’t belong to them. Options groups of global typology are added by default to all involved products (both for groups created by site administrator and by vendor). However, vendors can change this behavior for any of their products: By enabling “Disable globals”, from product editing page, global typology options will be removed from the related product. If a vendor is removed from the store, all the add-ons he had created and configured will be no longer available to the users. 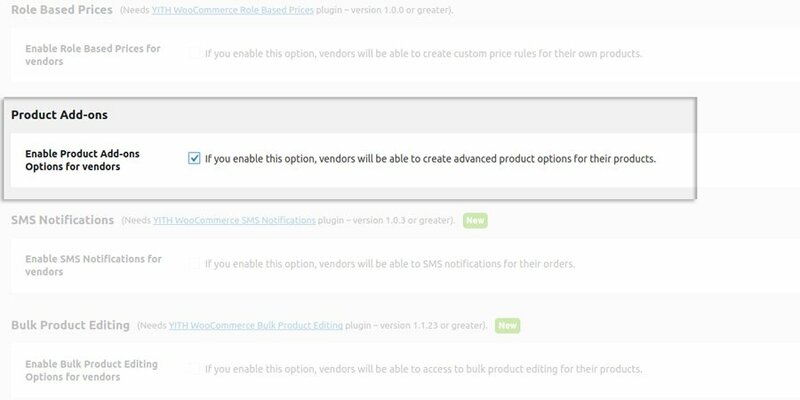 In order to show them again in the product page, you must set to “None” the “Vendor” entry among the settings of the specific options group. 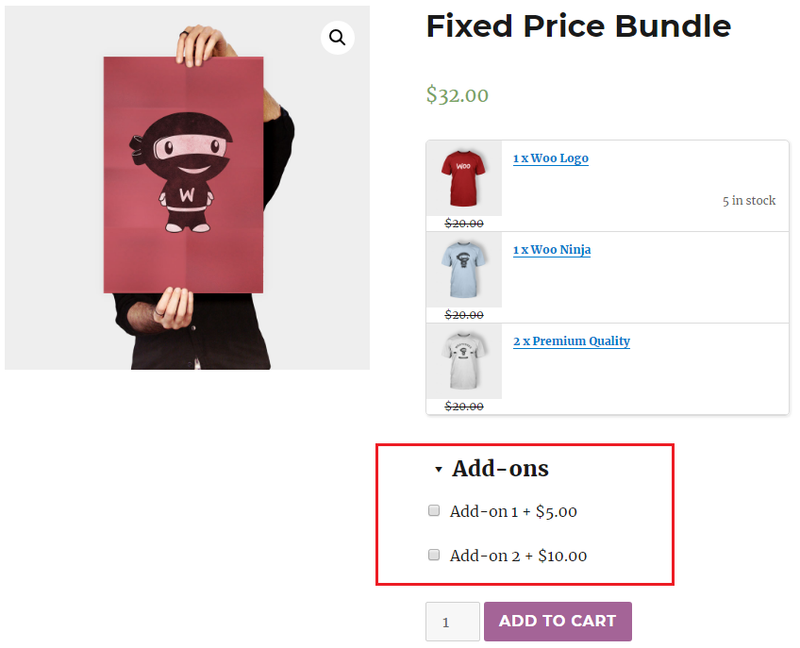 YITH WooCommerce Product Bundles is an extension created to make bundles by combining some products of your shop. You can assign a price to the bundle or a price given by the sum of the single elements contained in the bundle itself. You will only have to activate both plugins in order to make them work together. After that you can either add your product add-ons via the product edit page, or via the add-ons menu. The combined use of YITH WooCommerce Product Add-Ons and YITH WooCommerce Product Bundles allows adding custom product options also to “Bundle” products. For more information on how to set up bundled products, check the complete documentation here. 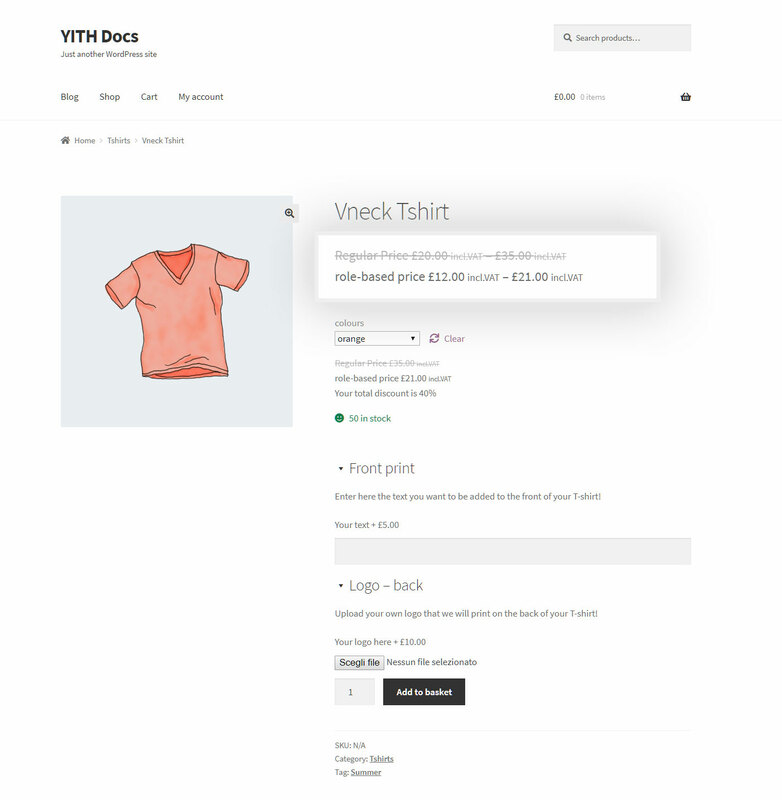 With YITH WooCommerce Quick View customers can get a quick view of the product which they are interested in. The product details will be shown in a popup, so they do not have to leave the page they are currently on. Tha Add-ons plugin allows you to configure additional options that can be added to the products in your shop. For each option, you can choose a name, an image and a price, which will add up to the basic ones the product has. You will only have to activate both plugins in order to make them work together. Using it in combination with YITH WooCommerce Quick view, you customers can select their options in the popup screen, without leaving the current page. With YITH WooCommerce Request a Quote you can offer users the chance to ask for a quote for one or more products in your shop. Once the request is received, you can process your offer and send it via email. Users can accept the offer and will be automatically redirected to the cart where they will find the exact agreed price. You will only have to activate both plugins to make them work together. Combining both plugins allows you to add any possible add-on the product shows, to the quote request. It will then be possible to receive the complete quote requests that will include products you are offering additional options for. For more information about how to set up YITH WooCommerce Request a Quote, check the full documentation here. YITH WooCommerce Role Based Prices lets you change the price of the products in your store dynamically, increasing or decreasing it based on the role the user has. The integration between this plugin and YITH Product Add-ons allows keeping different prices per different roles, but adding extra options to your products. The extra options price will remain unchanged for all the users, regardless of the price rules that apply to their own role. All you have to do is to activate both plugins from the Plugins menu and then start configuring your role-based prices rules from this page, which apply to the product regular price. After that, you can start configuring your add-ons to let your users have custom options and, if you want to, charge a fee for each selected add-on. Learn more about how to configure the add-ons on this page. All your users will be able to customize their own products thanks to the add-ons you’ve added to the product page. The product price will be calculated starting from their role-based price. The add-on prices will be the same for every user and will regularly add to the product role-based price. If you want to learn more about how to properly set up YITH Role Based Prices, please, refer to the plugin official documentation. 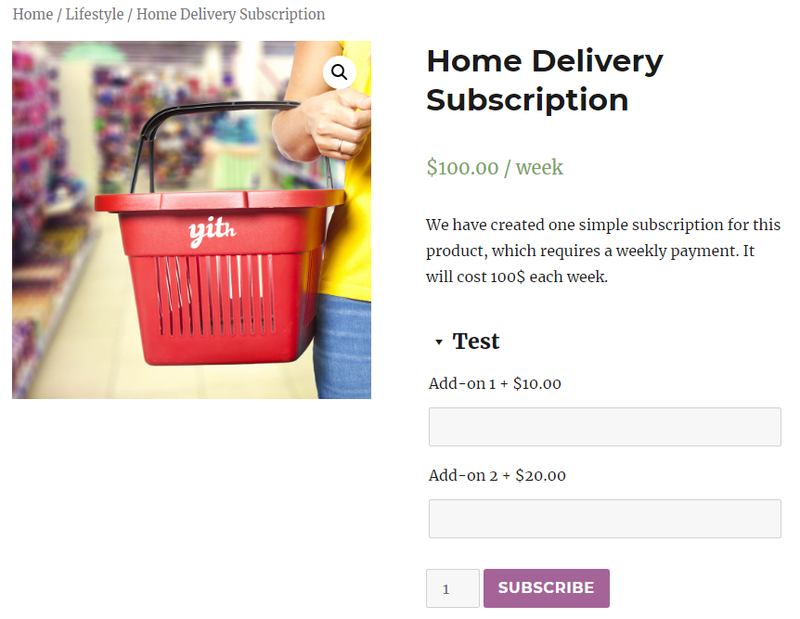 YITH WooCommerce Subscription is a plugin designed to enable recurring payments for the services offered in your shop. The integration between the two plugins will allow your users to purchase a subscription for several services, meaning, for instance, a “subscription” product with a custom set of selected add-ons. You will only have to activate both plugins, in order to make them work together. After that you can create your subscription product as usual, and add your add-ons. For more information on how to create a Subscription, check the documentation here. You can either add the Add-ons from the product editing page (example above). Or you can add them via the Add-ons menu. The recurring price of the subscription will be the regular price + add-on price.